The current St. Louis County Prosecuting Attorney's office has established a precedent of dishonesty. By preferring deceit over transparency, the office has been violating justice for decades. In 2017, in St. Louis County nearly 1,000 people spent time in pre-trial detention on misdemeanor charges because they couldn't afford to post bail. The cash bail system criminalizes poverty and the long-term damage bail inflicts on members of our community extends beyond pre-trial detention. The system separates people from their families and jeopardizes work and housing. Prosecutors have the power to eliminate cash bail, and it is imperative to do so. Read the article here. Julia Fogelberg, an attorney from the public defender's office speaks about her experience with the St. Louis County Prosecuting Attorney, Bob McCulloch. She sheds light on the injustices to St. Louis citizens that have flown under the radar. She has seen families torn apart, jobs lost, and lives destroyed in the name of justice. Julia emphasizes that the only way to change the status quo is to vote Bob McCulloch out of office and elect Wesley Bell. Missouri's sunshine laws are regulations that require certain proceedings of government agencies to be open and available to the public. 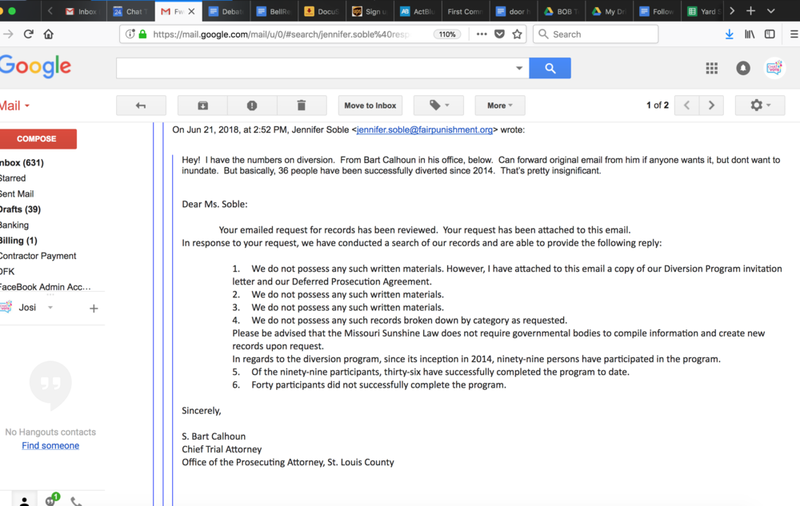 Current prosecuting attorney of St. Louis County, Bob McCulloch has ambiguous conditions for qualifications for diversion programs, prompting attorney, Jennifer Soble to sunshine the information. S. Bart Calhoun is the Chief Trial Attorney in the Prosecuting Attorney's office. When contacted by attorney Jennifer Soble regarding diversionary programs in the Prosecutor's office he reported that since 2014, only 36 people have been successfully diverted. 36 is shamefully low when compared to the thousands who would be helped by these programs. Reports from the Office of State Courts Administrator found that in 2017 less than 1% of felony cases were admitted to treatment courts. A majority of convicted felons are in need of some form of treatment and statistics like this are demonstrative of a lack of effort from the County Prosecutor's office. 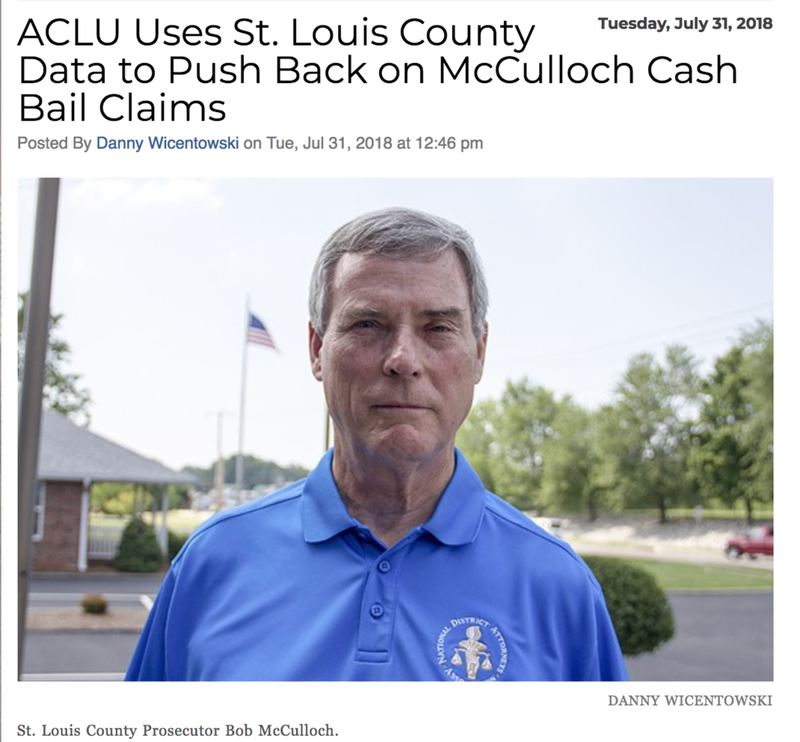 In an interview on St. Louis Public Radio's program "Politically Speaking", Bob McCulloch boasted of success in his Veteran's Treatment Court programs. He asserts that the programs are broadly beneficial to our community, however figures from the St. Louis County 2018 Adopted Budget (graphic on the left) are demonstrative of the opposite. In 2017 there were only 25 people involved in the Veteran's Treatment Court. The existence of programs like this isn't enough to aid our community, they need to be more readily available to those who need them.